They will accept emails submission in this one, I believe! 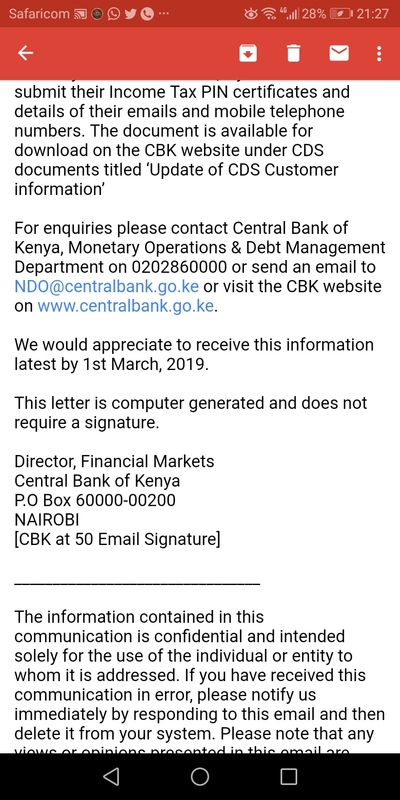 Is it that CBK does not have the info they are asking for or they have it but will assume it is incorrect till one visits them to verify? I have enquired and they've replied that I have to phyiscally present the requested documents. The whole exercise's aim is to nab tax cheats what is so alarming about that? Truth shall set you free!!! But why have a CDSC account for trading at the NSE and another for Bonds? I really do not understand. And worse you have to present yourself. You get money from shady deals in cash... You deposit the cash in your Investment Bank or Stock brokerage account.... The money thereafter is used to settle a bond trade for you in the secondary market...Still the coupon payments go to your bank acc? 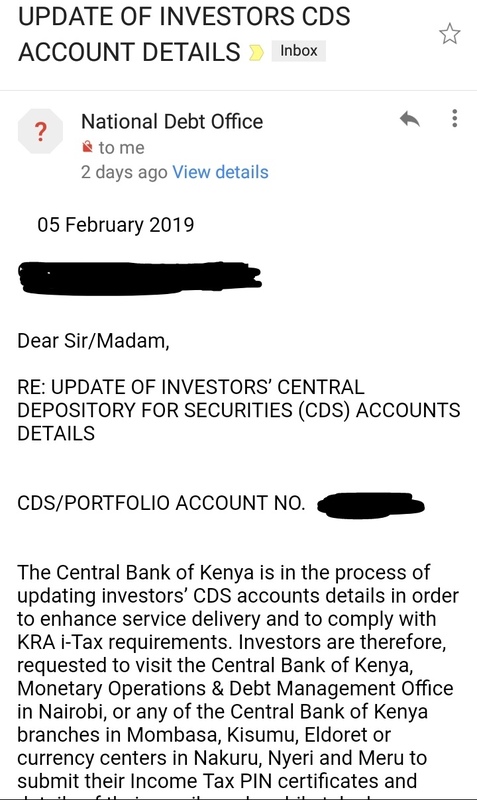 CBK is supposed to stay on top of technological developments and should have digitized a lot of their operations a long time ago. Otherwise we have a toothless dog watching over the financial system which is getting increasingly sophisticated. CBK please style up!! The way i see it: The earlier I do it the better, alternatively, I could get angry and still do it. Was passing by the CBK and these sagely words rang into my ears. I quickly made the required copies and decided to get the business done. Low and behold! They still insist on having the form witnessed by a "friend or family member" (NO document is required from the witness, just a name and ID number that are not verified anywhere!!!). Yawa uliwatibu na dawa yao!!! 19th century processes in the 21st century! Which form is this to be signed by friend/famo? I know they only want the pin certificate and your contacts.